A Pulitzer Prize–winning journalist's panoramic history of California and its impact on the nation, from the Gold Rush to Silicon Valley--told through the lens of the family dynasty that led the state for nearly a quarter century. Even in the land of reinvention, the story is exceptional: Pat Brown, the beloved father who presided over California during an era of unmatched expansion; Jerry Brown, the cerebral son who became the youngest governor in modern times--and then returned three decades later as the oldest. In The Browns of California, journalist and scholar Miriam Pawel weaves a narrative history that spans four generations, from August Schuckman, the Prussian immigrant who crossed the Plains in 1852 and settled on a northern California ranch, to his great-grandson Jerry Brown, who reclaimed the family homestead one hundred forty years later. Through the prism of their lives, we gain an essential understanding of California and an appreciation of its importance. The magisterial story is enhanced by dozens of striking photos, many published for the first time. This book gives new insights to those steeped in California history, offers a corrective for those who confuse stereotypes and legend for fact, and opens new vistas for readers familiar with only the sketchiest outlines of a place habitually viewed from afar with a mix of envy and awe, disdain, and fascination. Miriam Pawel is an award-winning reporter and editor who spent twenty-five years working for Newsday and the Los Angeles Times. She was recently an Alicia Patterson Foundation Fellow and a John Jacobs Fellow at the Berkeley Institute of Governmental Studies. "Pawel’s narrative is unflaggingly direct, but it also functions as deep art, for the book is actually a history of California posing as a family portrait. 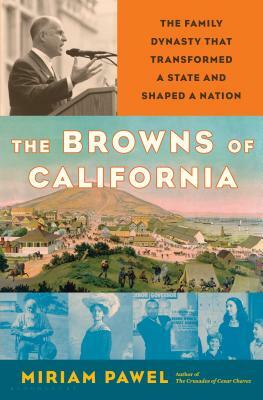 Whether it’s the Gold Rush, Japanese internment, Free Speech Movement, Watts riots, Proposition 13 or climate change, the Brown story reflects large portions of California’s past and much of its present…. A skillful portrait." - San Francisco Chronicle, "Best Books of the Year"